Oxford City had a great turn out in most age groups for a very chilly first Wessex League match of 2019 in Swindon. This strength and depth was evident in the match results. The Under 13 girls were once again out in force, PB’s and victories were plentiful both on the track and in the field. Stand out performances and A string wins came from Bronte Bennett Discus (19.05) and Javelin (24.60m); Annie Jonkers Long Jump (grade 1 jump of 4.56m), Payton Carter A string 1200m, (4.07) and Izzie Haines-Gray (2.32). The girls won their section of the match by a healthy margin, against some very tough opposition. Under 13 boys reaped the rewards of winter training and the pre-season jumps and throws competition, with Ben Straughan winning A string high jump (1.20m) and Connor Legg winning A string javelin (19.15). Albert Wootten also triumphed in the 75m hurdles (15.00). The boys filled almost every space in their team and as a result find themselves in second place after match 1. 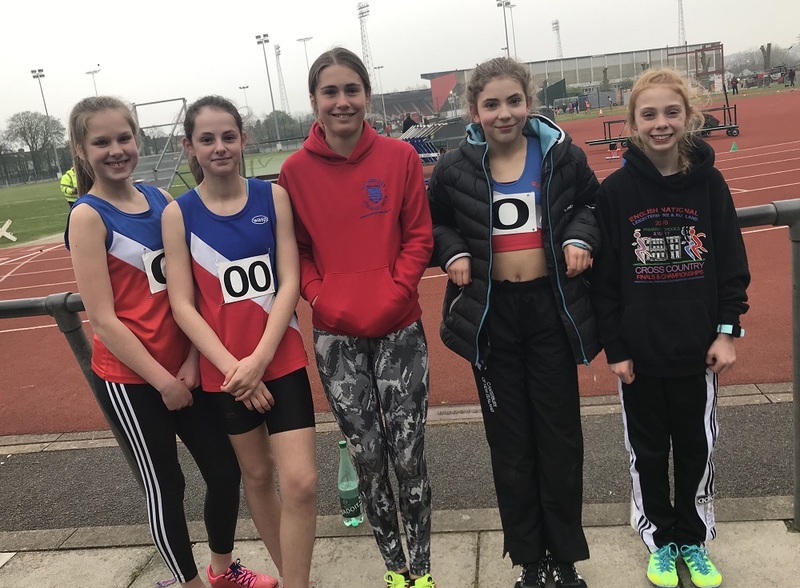 Under 15 Girls were also on good form with some promising results and Olivia Barton’s early season form continued with her grade 1 leap of 5.14m providing a win in the A string long jump. One or two injuries left a couple of gaps in the team but nonetheless they in finished the match in 3rd place. Under 15 boys had a few gaps in their team sheet and only one A string victory for Henry Channon in 1500m (4.25). There were some promising results and they finished in 4th place, ahead of Fleet and Waverley. A small, but perfectly formed team of just five U17 girls managed a really creditable 2nd place in the match behind a more numerous Woking team. Despite the cold, there were wins for Eugenia Mutero in the B String 100m and 200m, and more than a smattering of PBs, which bodes well for the summer. Equally small in numbers were the U17 men, but with some wins, Ben Davies A string 800m, Louis Enskat B string 1500m, Ben Ince A string 100m hurdles and many events filled they secured the top spot in the match 30 points ahead of Swindon in second. Congratulations to all our athletes – many of those moving up an an age group did themselves proud. Our athletes had magnificent team spirit, helping each other with their warm ups, filling in at the last minute and cheering each other on. Despite the cold weather spirits were not surprisingly high throughout the day, especially when the news filtered through that Oxford City had finished the main match in pole position, 17 points ahead of the hosts. A great start to the league – well done. The Quadkids were relatively few in number, but both boys and girls had the requisite 4 athletes needed to score, boys 3rd and girls 6th. Notable performances were from Kieran Legg who finished in 5th position overall and Adam Bennett who threw a mighty 34.90m in the howler.